God bless those New Orleans Saints. They've pulled off a 7-0 start for only the second time in their history. 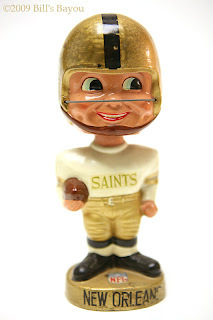 I've been a Saints fan for as long as there have been Saints. Somehow the stars have aligned and we're watching one of the best teams ever to play the sport. "Dear God, Please Get Me Out Of Here!" During the school year, the stars rarely align for my family when it comes to scheduling. Sunday was no different. I decided that a beautiful Sunday morning is a wonderful chance to tear down and rebuild a fence. Indeed it was. However, as my father once told me "Projects are always more complicated than they seem; are more expensive than you expect; and take longer than you hoped." Each of my home projects seem to fall in line with that simple expectation. The wife took the youngest off to church while the older hellions slept off Saturday night. I took crowbar to board and uncovered one setback after another; crooked posts, rotten wood, and sub-standard construction are all hallmarks of any project completed by the previous homeowner. This was no exception. After working all day on removing the old fence and acquiring the supplies to build the new one, 5pm was creeping up on me fast. The last church mass of the day would see me packing up my tools and looking at 7 original fence posts without a single piece of new work upon them. What made me think I could do this in one day? Mrs. Bayou's prior commitment to the local school's fund-raiser had her out of the house at this time and our youngest could not be left home alone. I told her so. "BUT I ALREADY WENT TO CHURCH! I DON'T HAVE TO GO AGAIN! I'M NOT GOING!" was her thundering reply. The oldest kids smirked and headed off to church on their own. I'm not sure if they were behaving properly or jumping ship. Kicking and screaming, I threw the little monster into the car and we made it to church on time. 5 minutes into mass and an angel appeared. Mom had stopped by the church on her way home and picked up The Sulking One. I would later find out that while she did not want to go to church, she was a firm believer in prayer. "Mom, I knew you would come," my wife said, retelling what she heard. "I was in church praying to God. 'Dear God, please get me out of here,' and you came!" I'm learning things about the youngest kids in wide age-span families: They quickly learn how to work the system. Apparently, this one has learned how to work God. Odd but the little lass's faith has probably been sustained for quite some time to come from that one experience ;) She'll think to herself... "Yes, God doesn't need me to go to church twice in one day, He understands me, He loves me, He takes care of me. He sends my mother to rescue me. He knows more than Bill's Bayou. I can always go to Him in prayer and He will find me a way out." You might just have gotten something far reaching out of that little experience :) ... a child who prays daily.